All hail centurion Christian Pulisic, Borussia Dortmund’s super-talented attacker whose sparkling skills and explosive pace have powered the Pennsylvania poster boy to a milestone 100 senior games in Black and Yellow. He reached the magic number on his 20th birthday, scoring the winner for Dortmund in their 1-0 victory away to Club Brugge in their opening UEFA Champions League assignment in 2018/19. It was a fitting way for the USA schemer to mark the occasion, having sped his way to a century of appearances in all competitions in double-quick time since making his BVB bow back in January 2016. 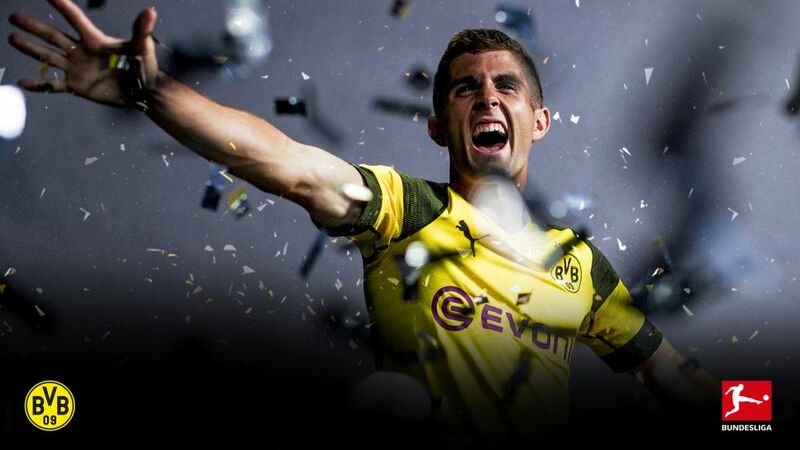 Now every bit a world footballing phenomenon, bundesliga.com looks back on several momentous Pulisic moments that have paved the way to the latest stop on the road superstardom. The tale of the Pulisic tape makes for impressive reading: Bundesliga – 71 games, DFB Cup – 6, UEFA Champions League – 16, UEFA Europa League – 6, DFL Supercup – 1. Yet it all started two-and-a-half years ago with game number one. "We saw that coming." The USA coach at the time, Jürgen Klinsmann, was not as surprised by the sight of Pulisic replacing Adrian Ramos 22 minutes from time of a 2-0 win over Ingolstadt as many of those unaware of the diamond Dortmund had been lovingly polishing up for this moment. "I've worked very hard for this day," commented Pulisic, aged just 17 years and 133 days - the eighth-youngest Bundesliga debutant at the time - after taking the first step down the road to becoming the second-most famous export from his Pennsylvanian hometown of Hershey after its eponymous chocolate bar. "He has shown the courage from training also in the match today," then Dortmund boss Thomas Tuchel said after the game. Three weeks later, Tuchel showed more of his own courage and faith in Pulisic, handing the youngster his first Bundesliga start in a 1-0 win against Bayer Leverkusen. A Round of 32 Europa League game may not be the grandest of stages on which to make U.S. football history, but Pulisic did that in a 2-0 win over Porto in February 2016. Though he only played the last three minutes as a late substitute, it was another important step in a career that was accelerated by his Croatian heritage. "As a result of my dual citizenship, I've been able to play in Europe, training at the Dortmund academy, since I was 16. Without it? I would have had to wait until I was 18. And for a soccer player … man, ask anyone and they'll tell you — those age 16–18 years are everything," Pulisic later wrote in The Players' Tribune. "From a developmental perspective, it's almost like this sweet spot: It's the age where a player's growth and skill sort of intersect, in just the right way — and where, with the right direction, a player can make their biggest leap in development by far." Having thrown Pulisic in at the deep end and found that not only could he swim, but that he could cause quite a splash, Tuchel kept faith with his young charge. Further reward for that belief came seven minutes before half-time of the Matchday 30 game with Hamburg. "I didn’t know what to think to be honest. I was just focused on my celebration," said Pulisic having brought dabbing to Dortmund at the age of 17 years, six months and 30 days. Watch: Pulisic bags an important first for BVB! "I was so excited to finally get my first goal in the Bundesliga. It was just amazing." When he found the net against Stuttgart six days later, he was the youngest-ever Bundesliga player with two goals to his name. After his Bundesliga debut, Klinsmann had pondered where Pulisic might go with his country having played up to only U17 level at that stage. "It makes us think obviously so how can we kind of fill the right slot for Christian over the next couple of months as well," said the former Bayern Munich forward and coach. "Is he maybe already down the road ready for getting a taste with us?" The California-based tactician decided Pulisic was. He handed him his debut against Guatemala in March to make the BVB man the youngest-ever USMNT first-timer in a World Cup qualifier before he found the net in a friendly against Bolivia to become his nation's most precocious goalscorer at just 17 years and 253 days. The Polish capital, Warsaw, saw Pulisic come of age, albeit still a very young one, as he made his bow in European club football's premier competition a handful of days before his 18th birthday. Overawed by the occasion? Not a chance. He may not have been old enough to legally buy a whisky in Germany, but he was already sufficiently mature to terrorise the Legia defence. As the youngest American to feature in the competition, he even registered an assist — teeing up Gonzalo Castro for the fifth — in a 6-0 canter. Tellingly, he had more touches in the opposition penalty area — 15 to be precise — than any other player in the competition's opening round of fixtures. What was that Tuchel said about courage? DaMarcus Beasley, Jermaine Jones and Fabian Johnson had all done it before him. Jovan Kirovski had even done it for Dortmund, but Pulisic chalked up yet another milestone when he found the net in the Last 16 win over Benfica, the youngest of the seven Americans to have scored in the competition. After assisting ex-BVB forwardPierre-Emerick Aubameyang's strike, Pulisic then raced onto Lukasz Piszczek's pass before brilliantly lifting the ball over the advancing Ederson, the now Manchester City goalkeeper beaten by a sublimely cool headed finish beyond Pulisic's tender years. "Quite honestly, that way of chipping it is something Auba [Aubameyang] has given me. As for the goal itself: Lukasz Piszczek gave me a really perfect pass. I only had to make the run at the right time and put it in." Easy, isn't it?!? The bomb attack that hit the Dortmund team coach en route to the first leg of their UEFA Champions League quarter-final with Monaco was a huge black cloud over the 2016/17 campaign, but the season ended on a high for Die Schwarzgelben and Pulisic in particular. Involved in nine Bundesliga goals, scoring three himself, Pulisic saved the best for the last of his 43 competitive appearances in what has been his most complete season to date. "It was really special, especially after a tough season like that with a lot of ups and downs," said Pulisic after claiming the USA's first major winner's medal in European football with a DFB Cup final win over Eintracht Frankfurt. "To finish it with a trophy was just a really good feeling. Just to see the excitement on [my teammates'] faces after that was just really amazing to me." Pulisic matched reaching his appearance milestone with one of the biggest days of the season for Dortmund in the 2017/18 season. The Revierderby is one of Germany's fiercest rivalries, but the encounter on Matchday 13 was one Pulisic would likely rather have forgotten, as Dortmund allowed a four-goal lead to slip at home to the Royal Blues of Schalke, who scored a 94th-minute equaliser to draw an end to one of the best Revierderby matches ever played. He became Dortmund's youngest player to reach 50 appearances, as well as the youngest non-German to reach the number in the Bundesliga in that momentous clash. Added to that, a first appearance against friend and compatriot Weston McKennie of Schalke was another moment to cherish. Pulisic had already claimed the U.S. federation's Young Male Athlete of the Year award in 2016 following his breakthrough season at the Signal Iduna Park, when he became the youngest ever player to be named the USA Men's National Team's Player of the Year by US Soccer. The 19-year-old saw off competition from 2016 winner Jozy Altidore, veteran former Tottenham Hotspur forward Clint Dempsey, ex-Borussia Mönchengladbach midfielder Michael Bradley and Seattle Sounders' MLS star Jordan Morris to earn the honour. "It's an amazing award, something I'm very proud of," Pulisic, who scooped 94 per cent of votes, told viewers of a Facebook live cast on US Soccer's official page. "It's been a crazy journey. I can't wait to see what's gonna happen in the next few months." And here we are. Pulisic brought up match number 100 for Dortmund at Brugge in the Champions League. The 12 goals and 20 assists in all competitions that came prior to his landmark game are mere numbers that serve to highlight the incredible impression Pulisic has made on all those who have witnessed his remarkable on-field abilities and off-field humility. Christian, we salute you. Here's to 100 more!